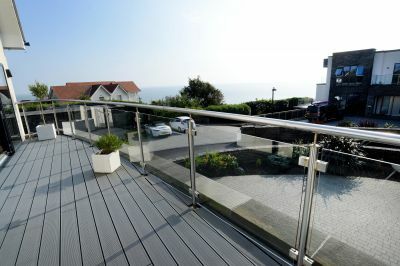 A bespoke, lifestyle designed property situated on the award winning Gower coast line in Langland. This truly idyllic location with picturesque sea view provides tranquil living with the sound of the waves crashing onto the golden sandy beach. Set over 3 floors with 6 double bedrooms and vast living space the property welcomes family living with the additional enjoyment of an indoor swimming pool. The property possesses a window tinting technology allowing you to enjoy the special views whilst at the same time ensuring privacy. The ground floor is equipped with underfloor heating and built in Sonos sound system. On entering the property the spacious hall with impressive hard wood and glass balustrade staircase and spot lighting leads to the upper floors, whilst your eye continues through to the open plan dining area, tiled floor and garden views beyond with the additional skylight window allowing the light to pour in. The family kitchen room with extensive floor to ceiling windows and bi folding doors to the rear offer light and airy space with fitted modern units and integral Siemens appliances including eye level oven, duel function steam oven, coffee machine, dishwasher, fridge freezer and wine cooler. 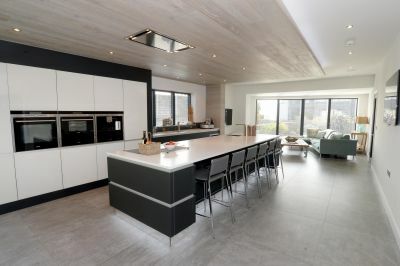 The central island offers additional dining space with inset electric hob and inset extractor fan over. The outdoor space is a private lawn and patio area to the rear with the bi fold doors from the ground floor inviting outdoor living and entertaining. 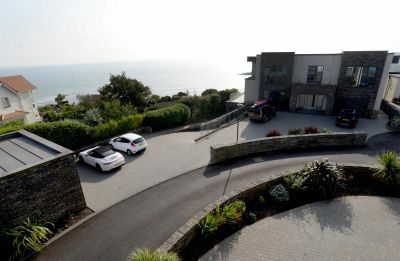 The front provided paved parking for several vehicles leading to the garage with electric secure doorsA bespoke, lifestyle designed property situated on the award winning Gower coast line in Langland. This truly idyllic location with picturesque sea view provides tranquil living with the sound of the waves crashing onto the golden sandy beach. Set over 3 floors with 6 double bedrooms and vast living space the property welcomes family living with the additional enjoyment of an indoor swimming pool. The property possesses a window tinting technology allowing you to enjoy the special views whilst at the same time ensuring privacy. The ground floor is equipped with underfloor heating and built in Sonos sound system.On entering the property the spacious hall with impressive hard wood and glass balustrade staircase and spot lighting leads to the upper floors, whilst your eye continues through to the open plan dining area, tiled floor and garden views beyond with the additional skylight window allowing the light to pour in.The family kitchen room with extensive floor to ceiling windows and bi folding doors to the rear offer light and airy space with fitted modern units and integral Siemens appliances including eye level oven, duel function steam oven, coffee machine, dishwasher, fridge freezer and wine cooler. 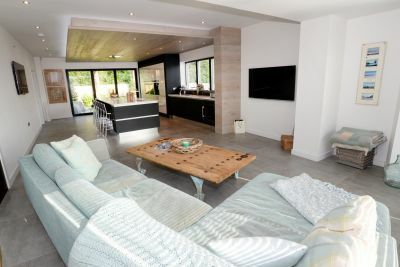 The central island offers additional dining space with inset electric hob and inset extractor fan over.The living room is a quiet retreat with floor to ceiling windows with garden views with the additional reception room as an alternative versatile space currently used as a games room. The ground floor complete with under floor heating and built in Sonos sound systemThere is also a fully tiled cloakroom with modern floor standing wash hand basin and floating W.C, and utility room giving access to the garage.The pool Room is a spectacular space with stretch reflective ceiling and sliding patio door opening to the enclosed private garden with patio. 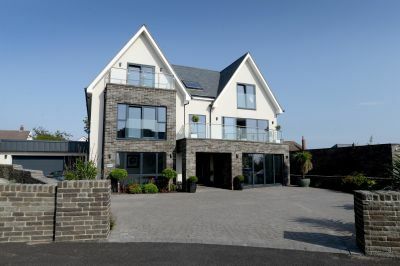 The first floor houses the master bedroom, a spacious light suite with patio door to a sea facing sit out balcony with breath taking views over the bay. A walk in wardrobe complete with hanging rails and storage space gives ample storage, while the en suite bathroom with Teuco freestanding bath, walk in shower with waterfall shower provides a beautiful space to relax. The 2 further bedrooms on this level both offer spacious accommodation both with walk in wardrobe and ensuite with the bedrooms to the front enjoying sea and views over the golf course.To the second floor the spacious landing has a beautiful Velux window with views of the coast.A further two double bedrooms, one with outstanding sea and golf course views from a viewing balcony to the front of the property and ensuite facilities. 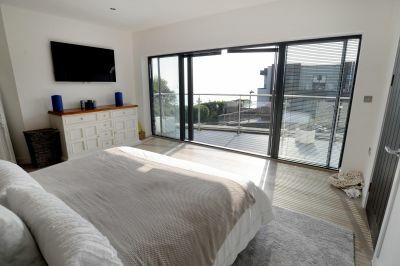 The remaining bedroom offer a private living room with floor to ceiling window to the front with outstanding sea views with additional Velux window to the side also enjoying sea views, an ensuite shower room and bedroom area with Velux window to the size. 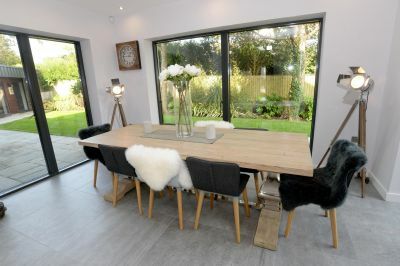 The perfect haven for any teenager or grown up alike.The outdoor space is a private lawn and patio area to the rear with the bi fold doors from the ground floor inviting outdoor living and entertaining. The front provided paved parking for several vehicles leading to the garage with electric secure doors.